When it comes to cancer, hope becomes a pretty important ingredient for living your best life. Hope gives us the strength to keep living and to keep looking for answers. Hope is not to be confused with denial. 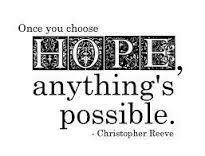 Hope doesn't mean that we can't look at our future realistically but it does mean that we are open to possibilities. I have seen some pretty profound examples of people who have well outlived their prognosis and there are some doctors and scientists who very strongly believe that there is a connection between our psychological state and a patients survival outcomes, most notably Dr. Bernie Siegel who wrote the famous book, "Love, Medicine and Miracles". I read his book during my radiation treatment and it helped to ignite a big flame of hope inside of me and allowed me to reconnect with myself and my body. I find I need to be reminded of this often! Modern medicine is amazing and what it can achieve is in some cases is completely miraculous. But its worth reconnecting on a regular basis with the fact that our body is incredible too and our minds are so powerful. I did my research when I was diagnosed with cancer and what I discovered was that if I survived my cancer, then there would be a mine field of obstacles to overcome in the months and years following. I was most likely to die of a second cancer as a result of the treatment used to save me from the first and had a 40% chance of that being breast cancer. This hit me pretty hard. And I floundered for a while as I tried to come to terms with this reality. The thing about hope is, it calls us into action. If there is hope, then suddenly it is worth looking after ourselves. It becomes valuable to nourish our bodies because if we do, hopefully they will serve us well. The hope I found compelled me to look into what actions I could take to ensure I lived as well as I could for as long as I could. Hope comes in different forms for different people. People report finding hope in friends and family, in talking to others going through a similar experience and sharing their stories, or in their spiritual life. Initially I found hope in research and studies. I found hope in listening to my body and I found hope in meditation. I continue to fuel my hope for a good long life by eating healthy food, doing yoga and connecting with and serving others. For everyone, it's going to be different. So find what fuels YOUR hope fire, and stoke it regularly because you are worth it! Another more recent advocate for the power of our minds and the strength and amazing healing capabilities of our bodies is Dr. Lissa Rankin. She has just published a book titled "Mind Over Medicine". I recently heard her interviewed by Jonathan Fields on The Good Life Project and had to immediately play it again for my husband to hear as I couldn't believe my ears. You can watch her interview here. Whether or not holding onto hope really has the ability to prolong our lives or not, no-one has the right to take away your hope, no matter what their beliefs are. I have seen too many people survive when they weren't supposed to or outlive their prognosis by years. Whenever someone comes to tell me that they have been "given - - months to live" I ask them who gave that to you? and then recommend that they give it straight back. None of us know how many days we may have left so I live in Hope (that is the actual name of the town I live in!) and wake up grateful every morning that I am here for another glorious day. Want to hear some more incredible stories?